The Lower Elementary Cottage: I WON!!!! Letter "S" Activities and Currently!! I WON! I WON! I WON!! So I must start by saying I NEVER win anything, and today was a terrible day. Then all of a sudden I checked my email in the 2 minutes of peace I had all day and I got a "You're a winner!" email!!! First thought... this must be a scam, I don't win things, and this can't be happening. Then I looked at Facebook and saw they posted my name there too!! I really did win something! Oops, I should probably mention what I won... I was the winner of the ALEX Toys/Scholastic Storybooks Sweepstakes. I get either Moody Monsters, or Jungle Party storybook and a craft activity to go with it. It's not too late, you could win tomorrow! Go enter!! I was so excited and it was a happy end to a terrible, screaming tantrums kind of day. Without exaggeration, I had 2 hours of screaming, several instances of carrying a child back to class, and of course an observation for one of my students during the chaos from an outside agency who knows nothing about me or my class. Today was one of those days where I really missed being a general ed teacher. Today I found myself missing the days when rewards and positive reinforcement were all you needed for a happy class, or on a bad day the threat of losing 2 minutes of recess. It's so hard when no form of reward or consequence helps. Some days are just bad, you pretend you're fine until it finally is, and today was one of those days. Winning the sweepstakes was the little ray of sunshine at the end of the day that I really needed. Ok, thanks for reading my rant... Back to the good stuff!! 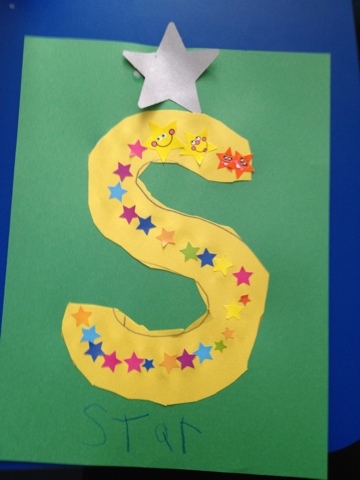 The letter of the week for my kinder kids is "S" and we had a very successful craft activity. 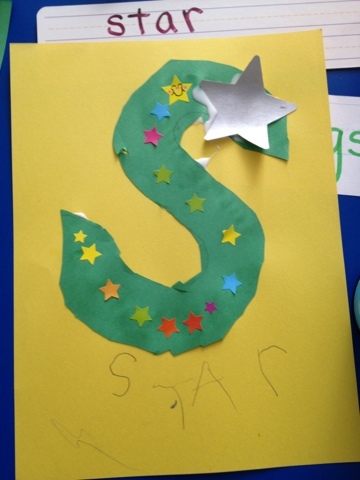 We traced the letter S on our favorite color paper, then put stars all over it (since "star" begins with s) and then we wrote the word "star" under it. Check it out below. Note the super awesome cutting skills! I didn't help at all this time and those curves are hard for my little guys with poor fine motor skills. Can you believe how nice their writing is and we've only been in school for a month?!?! My little guys are making so much progress! I even caught one of my boys "stretching" out his words in his writing book and actually getting a good chunk of the sounds right! I love when kids make fast progress. Even better yet, the boy who is seriously struggling behaviorally is making huge academic strides too! He's not behind at all! So apparently I'm doing things right when there isn't chaos. My new found love is PowerPoint!! I have little to no technology in my class, so I rarely use it. I have only one computer that works most of the time and that's my laptop that crashes often. 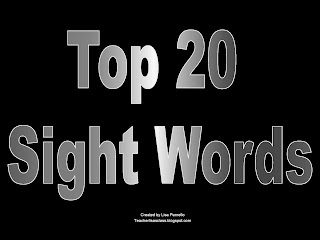 Anyway, the kids are loving when I put on the sight word and ABC PowerPoints to practice their skills. Somehow it's way more exciting than a flashcard with the exact same info! The wonderful power of color and a computer screen! My 1st and 2nd great kids are doing equal parts awesome and struggling. Academically, they are great, but their social skills struggles are really hurting them. They can't understand how to understand or ask questions. I ask a "why?" question and either get a blank stare or a strange mix of words that don't make sense. I should mention, for those who don't know, that these kiddos have autism and this is a huge deficit of the disorder. I found myself literally pouring things on the floor and asking them why the floor was messy so they could practice answering the questions with "because..." answers! Looks like I need to create an intervention plan for asking questions. 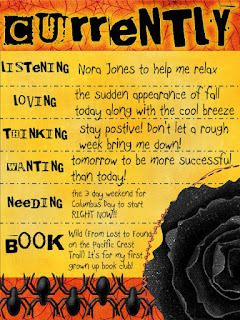 Now, last but not least, the October Currently linky with Oh' Boy 4th Grade! Doesn't she look amazing with her progress on her exercise plan! Great job! Just stopping by to check out your October currently. Hope you have a better week next week! Love those stars! I will have to remember that when we get to S. Do you have any tricks for helping the kiddos to remember the letters they are working on? Some of my guys can find a letter...match it...but not tell me the name of the letter they are working on. I just discovered your blog through Farley's currently! It's quite clever and I am looking forward to reading more of it!